2105b, Used Rims, 17X9, 6 LUG, 4-1/2", 02-04, DODGE, DAKOTA, DURANGO, CHROME, 5 SPLIT SPOKE, ALLOY. 2204, Used Rims, 16X6, 5 LUG, 4-1/2", 03-05, Dodge, STRATUS, SPARKLE SILVER, 5 SPLIT SPOKE, ALLOY. 2398, USED RIM, 17X6-1/2, 5 LUG, 5", 11-12, DODGE CARAVAN, ALUM, PAINTED SILVER, 5 SPLIT SPOKE. 3238, Hubcap used, 15", 04-08, CHEVY, MALIBU, SPARKLE SILVER, 5 SPLIT SPOKES, 5 GRAY PLASTIC LUG NUT, RAISED CENTER WITH GOLD BOW TIE, HELD ON BY LUG NUTS. 3366a, USED RIM, 15X6, 4 LUG, 4-1/4", 00-04, FORD, Focus. PAINTED SPARKLE SILVER, SPLIT 5 SPOKE ALUM. 3559c, Used Rims, 18X7-1/2, 6 LUG, 135MM, 05-08, FORD, F-150, PICKUP, CHROME, 5 SPLIT SPOKES, ALLOY. 3861, USED RIM, 20X8-1/2, 5 LUG, 4-1/2", 13-14, FORD, EXPLORER, ALUM, POLISHED, 5 SPLIT SPOKE. 3871, USED RIM [COPY], 17X7-1/2, 5 LUG, 4-1/2", 12, FORD, FUSION, ALUM, SILVER, 5 SPLIT SPOKE WITH TRIANGLE SHAPES ON SPOKES END. 53083, Hubcap used, 15", 10-11, NISSAN, VERSA, 5 SPLIT SPOKE DESIGN (5 DOUBLE SPOKE), SILVER, RAISED CHROME WORD NISSAN, 10 PLASTIC CLIPS, WIRE RING. 64894, USED RIM, 16X6-1/2, 5 LUG, 114MM, 07-09, MAZDA, 3, 5 SPLIT SPOKE [V SPOKE] SILVER PAINTED. 68721, CENTER CAP USED, 02-'05, SUBARU, IMPREZA, SPARKLE SILVER, ENGRAVED SUBARU, PLASTIC CLIPS, 2-5/16" DIA. 68721, CENTER CAP USED, 02-'05, SUBARU, IMPREZA, SPARKLE SILVER WITH ENGRAVED SUBARU IN CENTER, WITH PLASTIC CLIPS, 2-5/16". 5 SPLIT SPOKE ALUM. ALSO FITS 68720, 68737, 68739 & 68706 IS A FLAT CAP. 68721, Used Rims, 16X6-1/2, 5 LUG, 100MM, 02-'05, SUBARU, IMPREZA, 5 SPLIT SPOKE ALUM. 74637, Used Rims, 16X6-1/2, 5 LUG, 115mm, 11, KIA, OPTIMA, 10 SPOKE (5 SPLIT SPOKE), ALLOY. 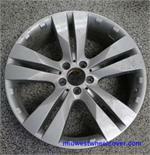 8038, HUBCAP, USED, 17", 11-13, DODGE, AVENGER, SPARKLE SILVER, 5 SPLIT SPOKE, D LUG NUT HOLES, HELD ON BY LUG NUTS.